The villa is situated on a private road close to the village of Valverde, an easy, twenty minute drive south by car or taxi from Alicante airport and only ten minutes from the nearest beach at the sea side town of Santa Pola - the minute we walked through the villa gates, we fell in love with the sense of peace and spaciousness of both the house and the garden and everyone who has visited it so far, has felt the same way. One of the things that attracted us to this part of the Costa Blanca is that visitors to the area are mainly Spanish - more paella than fish and chips and the coast offers miles of beautiful, sandy beaches, yet both Elche and Alicante are close enough for an evening in the city. 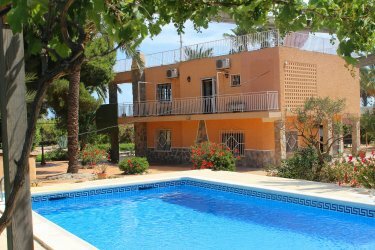 The villa has been renovated over the last eleven years to provide a very high standard of accomodation and is just as perfect for a couple as it is for a family. With garden walks, a boule court, plenty of space for just being quiet and excellent space for alfresco dining, it will surprise and entrance you from the moment that you arrive. We now have a brand new 40" Smart TV, FreeSat HD TV (BBC, Channel 4 and ITV HD channels), Wireless Broadband Internet connectivity, DVD player (and a big pile of DVD's), iPhone or iPod player and loads of music CD's for your pleasure. 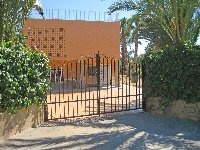 It is perfectly possible to spend a week in the villa and not feel bored - sunbathing by the large, private pool, relaxing in the shade under the palm trees in the garden, or, as the sun sets, walking the gravel paths through the orange, lemon and pomegranate groves that surround the villa. However, if you like to go out, the endless sandy beaches of the Costa Blanca are just a short drive away, the old towns in Alicante and Elche are close by, the Moors and Christian Fiestas with their colour and passion take place in Alicante, Elche and Santa Pola or the simple warmth of a summers evening in a bar or restaurant are not to be missed. 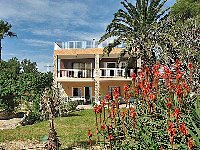 We hope that you too will enjoy your stay and feel the benefit of a well deserved holiday because of the care and attention that we have brought to our villa. We have 4 bedrooms, 3 bathrooms (one is ensuite in the master bedroom), large kitchen, dining room, lounge and utility room. 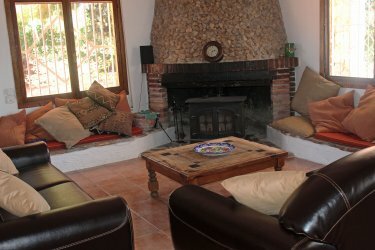 The VILLA has a lovely rustic feel and is decorated and furnished to a standard of comfort that we believe will offer you all that you need for a really wonderful holiday. It has been created to make a home from home where you will be able to relax away from all the pressures of daily life. 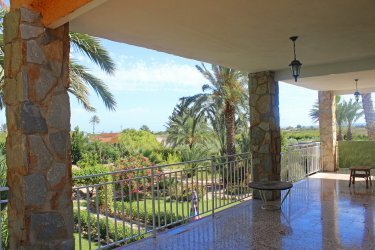 It is situated in pretty, open countryside and is surrounded by agricultural land with orange, lemon, olive and pomegranate groves spread across many miles of pathways that are ideal for walks and bike rides. Downstairs there is a large open plan kitchen, dining room and lounge with a bar. 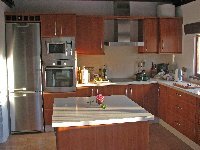 The kitchen has all the equipment you will need for a great time with a large refrigerator, a deep freeze, juicer(an absolute necessity with all those wonderful oranges), electrical hob, cooker and microwave. The kitchen looks out to the front of the house through large French windows and will give you sight of our roses, orange and lemon trees � you might even be able to pick a lemon to squeeze across your barbecued fish or into your gin and tonic within seconds of wishing for it. We provide tea towels and handtowels, condiments and a large selection of cooking pans to make things easy for you. 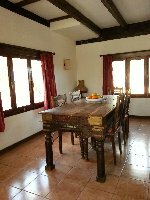 The dining room is furnished in a traditional style with a large table and chairs for relaxed meals at any time of the year and low lights to create a proper �dinner party� every night. The lounge has comfortable leather settees and a bar. It looks out onto a patio for early evening drinks, alfresco dining and the large back garden. Hidden away in the far corner is the downstairs shower, sink and toilet - this has been completly refurbished in a spanish style. Upstairs our pride is the large master bedroom and ensuite bathroom and walk-in wardrobe. The bedroom opens out onto the large upstairs terrace where you might like to bring breakfast before you begin another relaxing day. The bedroom furniture is made in traditional Spanish style and the comfortable king-size bed offers a great nights sleep. Down the corridor on the right you will find the second doube bedroom, which also opens out onto the upstairs terrace with palm and pine trees facing you. To the left are two more twin-bedded bedrooms. The recently modernised main bathroom with a bath and shower and twin sinks are also to the right. At the end of the corridor is the utility room with a washing machine and storage area. We provide all the bedding, towels, toilet rolls and washing powder that you will need to save you having to shop when you arrive. The garden is huge with a 10 metre pool, a boule court, two barbecue areas and plenty of places to relax, hide away, read a book, commune with nature or socialize with your friends and family. It has an open pergola with table and chairs situated specially to give shade at lunch time. Depending on the time of year that you visit, you might be able to pick oranges, lemons, figs and almonds from our very own trees. We have created a path around the whole of the garden to encourage those early evening strolls with a glass of wine in your hand. We have not one but two barbecues and you will usually find the makings for your first barbecue around (coals, firelighters etc) so there is little to do if you want to cook meat or fish on the barbecue the evening you arrive. The nearest shop is a 5 minute car journey or ten minutes on our two bicycles - we do recommend the hire of a car though this is not essential as there is good public transport close by. The nearbye town of Santa Pola offers good supermarkets, a great harbour with fresh fish every morning in the indoor market and every evening by the harbour and some great bars for an early evening gin and tonic or even dinner. The coast below Alicante and before you reach Torrievieca offers miles of beautiful, undeveloped, sandy beaches and lots of other attractions. 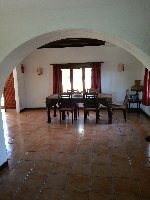 Its a great villa located in a wonderful place, so do come and sample its delights for yourselves.